You are at:Home»leadership»Ho ho hooyah! It’s that time of year again, and the top brass are issuing their holiday greetings. 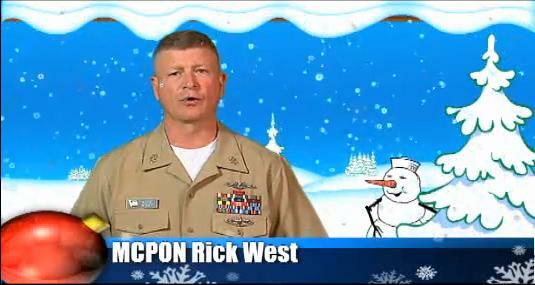 Top marks, as usual, go to MCPON Rick West with yet another creative video put out on his Facebook page. You can view it here. He seems to enjoy putting out goofy videos to get his message across. Thank you for your dedicated service and the great work you continue to do. Because of you, our nation can celebrate this holiday season knowing the world’s most powerful Navy is on watch around the world. To follow MCPON and CNO: A big thank you and happy holidays to our sailors from the staff here at Navy Times! I will never server on a gay army. Good luck.